The TR Tester - ET-01 - Low Temperature Retraction Tester is primarily used to determine low temperature characteristics by the temperature retraction procedure according to ISO 2921 and ASTM D-1329. 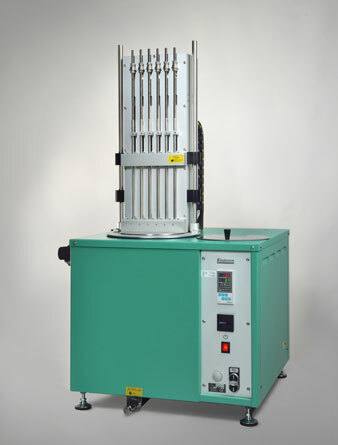 The TR Tester - ET-01 - Low Temperature Retraction Tester has 6 test stations, is computerized and performs the test automatically after the cooling media has been cooled down and the samples have been mounted. An automatic release of the samples is initiated after the pre cooling period has been completed. The computer controls both the temperature rise and measures the length change of the samples. The results are displayed in graph and TR10, TR30, TR50 and TR70 values are calculated. The result can also be presented as a table with length change versus temperature. The TR-values and the table values can be exported to other software such as spreadsheets. As an extra option, an automatic cooling system with liquid Nitrogen can be supplied.